When it comes to versatility in the kitchen, there aren’t too many dishes that can hold a candle to a Dutch baby. They can easily go savory or sweet. 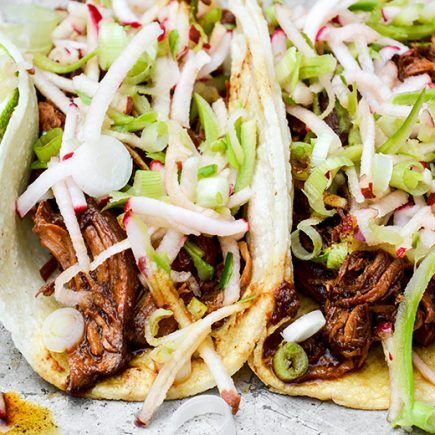 They seamlessly transition from breakfast to dinner (and every meal in between!). And depending on your mood, you can go as minimal or maximal as you wish with the toppings. Even without a single embellishment, a warm Dutch baby straight from the oven is still one of the most delicious things I can think of. Not to mention, they are one of the simplest foods that I know how to make. Just mix up a few pantry staples in a single bowl. Then pour that batter into a hot, buttery skillet to bake until it’s wonderfully puffed and golden. All those beautifully misshapen bubbles are enough to make anyone go weak in the knees! Today, we’re going the savory route with a bit of Parmesan cheese, some sliced scallions, fresh herbs and a big pile of roasted broccoli. If you want, you can serve this Dutch baby with a couple of slices of bacon on the side for one heck of a satisfying breakfast. 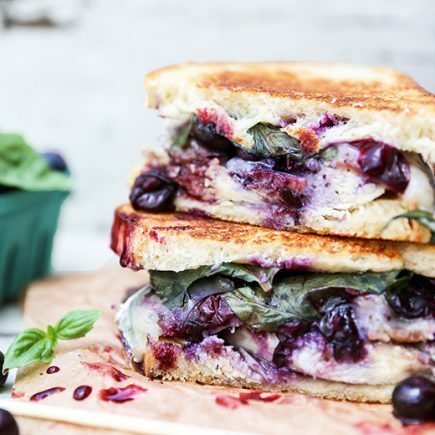 Or pair it with soup and a salad and enjoy it at lunch or dinner. Whatever you decide, just make sure you gobble it all up in one sitting, because Dutch babies are really best when eaten immediately after being made. But I have a feeling you’ll have no trouble accomplishing that task. 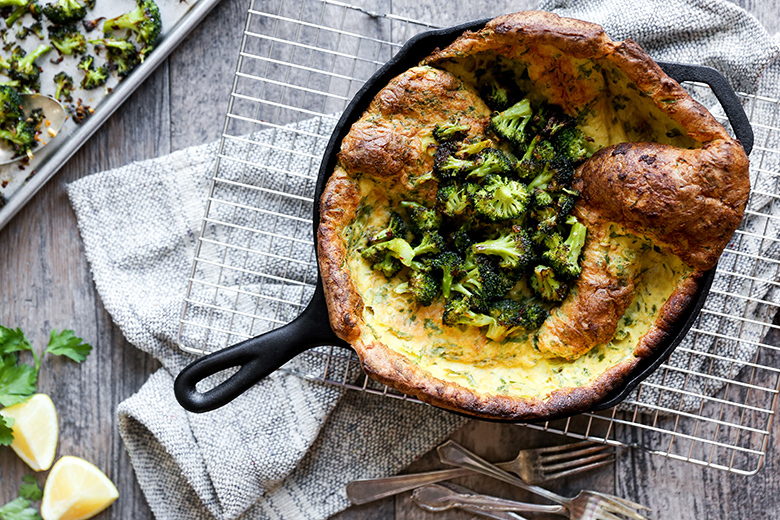 I’m sharing this Savory Dutch Baby with Roasted Broccoli today as part of our monthly seasonal eating guide organized by Becky of Vintage Mixer. 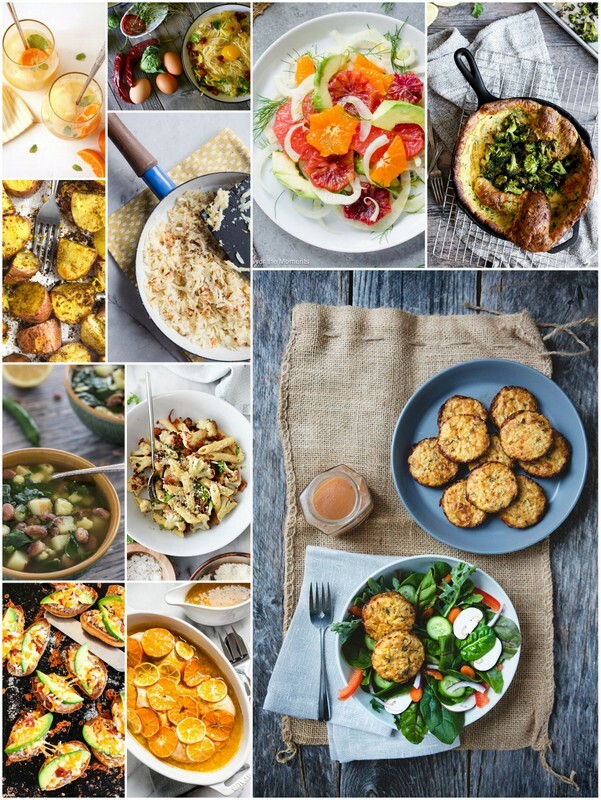 Be sure to check out her February produce guide for lots of winter inspiration. And scroll down below to see what my other blogging friends made this month! Make the Dutch baby. Pre-heat your oven to 425 degrees. In the bowl of your stand mixer with the whisk attachment, combine the eggs and milk. Add the flour and whisk until incorporated, scrapping down the sides of the bowl as necessary. Then whisk in the Parmesan cheese, sliced scallions, parsley, thyme, salt and black pepper. Set aside. Meanwhile, melt the butter in a 10-inch cast iron skillet over medium heat. Once the butter is melted and the skillet is hot, pour in the batter. Carefully transfer the skillet to your pre-heated oven and bake for 25 minutes. The Dutch baby will puff up during cooking, but once it’s removed from the oven and starts to cool it will deflate slightly. Meanwhile, roast the broccoli. In a medium bowl, toss the broccoli florets with the olive oil, salt and red pepper flakes. Spread the broccoli out onto a large rimmed baking sheet. Transfer to your pre-heated oven and roast for 15 minutes. Remove from the oven and sprinkle the lemon zest and juice over the roasted broccoli. 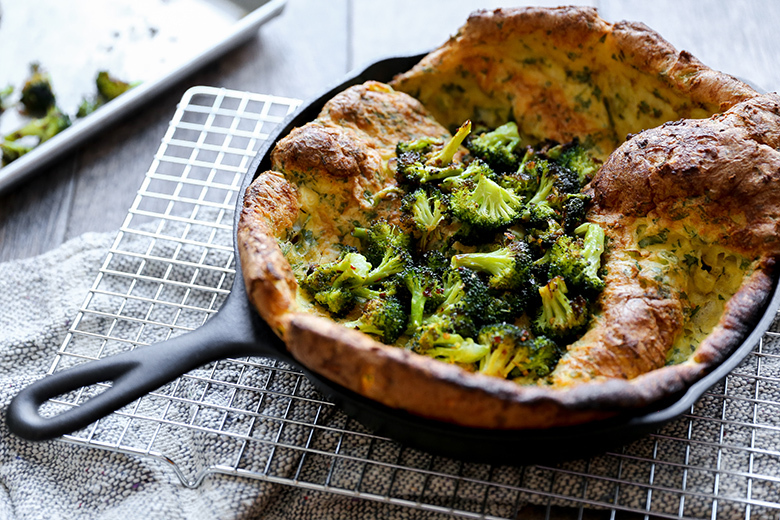 To finish, top the Dutch baby with the roasted broccoli. Slice and serve immediately. I love Dutch babies Liz! I usually go the sweet route, but looks like I need to try savory asap! I love to watch them while they bake and puff up too! This one is gorgeous! Thanks, Mary Ann! I usually do sweet as well, but it’s nice to change it up once in a while! Ha ha. Yeah, I think a lot of foods are kind of like that. OMG! See now you are speaking my love language. I have never made a dutch baby sweet or savory, but I am excited to try this version!! You’re going to love it, Lauren! I have yet to make a dutch baby, and this savory one looks like one great place to start! You just can’t go wrong with broccoli and cheese! Oh my gosh, Marcie! You need to make a Dutch baby ASAP. You’ll love it! Dutch babies are fabulously versatile, huh? I could easily eat them for breakfast, lunch and dinner on repeat! This one looks amazingly delicious, Liz! I have a few heads of broccoli in the fridge and I know what I’ll be doing with them! Dutch baby for days! Pinned! Cheers friend! Yay yay! I’ll be eating these for days too, because right now I’m getting snowed in. So no trips to the grocery store for me! This looks unreal! Roasted broccoli is the absolute best 🙂 Pinning! Man oh man. I’ve never made a dutch baby before (HOW?!?) 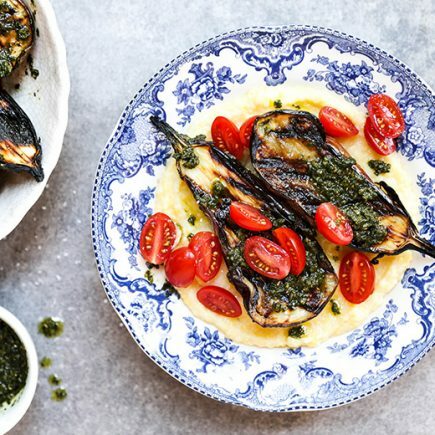 but I’m totally making this for dinner soon – it looks like PERFECTION. So much deliciousness! I didn’t even know you could make a savory dutch baby…?! LOL I better rectify that for myself asap!!! Pinning this for later! Yes, and it’s so good! You should definitely try it out soon! I’ve never had a savory dutch baby before but I love that idea!!! So my kind of dish!! You’re going to love it, Ashley! Not sure I’ve ever had a savory Dutch baby either, but I’d be all over it! Oh my gosh, Biz that is amazing news! And so glad you thought of me. So sweet. I’m super excited for you and your new adventures! I know it will be great! I have never heard of a Dutch Baby before, sweet or savory, I thought this was a frittata at first. What is the difference? What do you use to keep your cast iron seasoned? Did you apply anything to it before you filled it with the ingredients? A fritta doesn’t usually have flour – just eggs and milk as the base. A Dutch baby is kind of like a pancake/popover hybrid. The butter is melted in the cast iron before adding the batter (step 2 in the recipe instructions above). I am so behind the curve, I’ve never made a Dutch Baby! And everything you make is so gorgeous, i want it all! You will love them, Sue! I hope you try one soon. Please let me know! Is this a Yorkshire pudding? Hi Beth. Yorkshire pudding, popovers and dutch babies are all very similar. I love this savory idea with broccoli! It looks stunning as well… this would keep me nice and filled 🙂 Beautiful work! Thank you, Alison! Let me know if you try it out! I made this for dinner tonight and it was AMAZING! Next time I think I will add some roasted potatoes or hash browns on top as well. Do you think this would work with Almond milk? We have a dairy allergy here but I’d really like to try it. Yes, my Mom makes this with almond/soy milk and it works great!